I recently met a 16-year-old schoolgirl on placement with Lantra, the land-based learning organisation. She is from an urban background and wants to become a lawyer. There are a number of perceptions she has about the countryside that really made me think. The first was that she assumed farming and rural places to be less progressive than towns and cities, but what she’d learnt from her week with Lantra told her different. Her second point was a challenge to all of us living and working in the countryside – why don’t we do more to tell young people how many fabulous job opportunities there are in farming and rural industries? During her career guidance sessions, she said that she had had no exposure to land-based roles open to her. The final point she made was that she felt we are missing a trick in not engaging with “town kids” to get them motivated towards working, for example, in agriculture, forestry or rural tourism. What’s even more staggering is that when I’ve talked to employers in agriculture and wider rural businesses, they say that they are struggling to recruit young people interested in working on, or close to the land or sea. I think it’s this disconnect between rural and urban that frustrates me the most and has spurred me into joining the Lantra board of trustees. Through exposing young people to good skills training and learning, we have the chance to engage some of the best of them into rural jobs and communities, and if their experiences are good ones, they’ll stay for the rest of their lives. Lantra in Scotland is investing a huge amount of time and effort into youth outreach and encouragement. With the support of the Scottish Assembly, the Lantra Industry Champions Programme is making significant progress in highlighting the career options in a wide variety of sectors. Its success can largely be attributed to the engagement of those young people who have won Scotland Learner of the Year awards to act as ambassadors for their sectors. These inspirational young people not only have great stories to tell but have the immense advantage of being of like mind when sharing their experiences with fellow youngsters. One example is Emma Staniforth, the winner of the 2017 Lantra Learner of the Year Award. Emma is from Dumfries – and she’s not your typical forester. 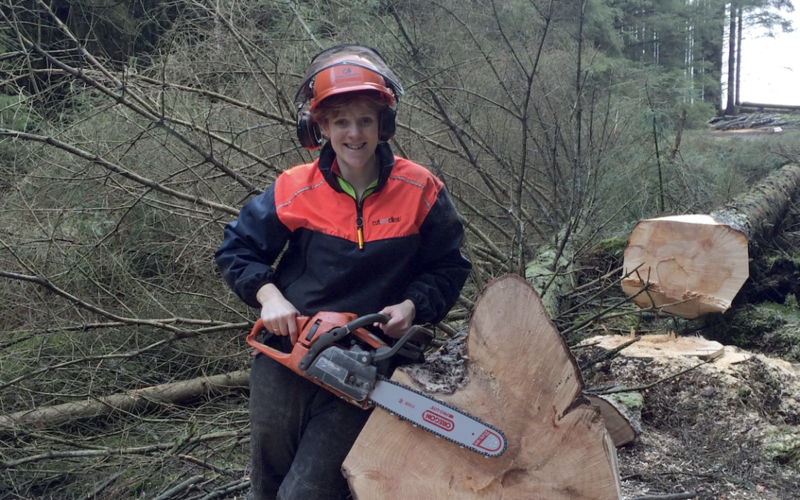 As one of the few women working in a male-dominated sector – only 24% of the total forestry workforce are female – she is already breaking the mould. At the age of 34 and having no prior experience, Emma was chosen out of 800 applicants to join Forest Enterprise Scotland’s highly sought-after Modern Apprenticeship programme. What is even more remarkable, is that only 11 made the grade and Emma was one of only two women selected. If we all did a little bit to encourage new blood and talent into our rural places, what kind of future could we create?